Downtown Naperville has captured the essence and charm of a fun, bustling, walking Americana town. 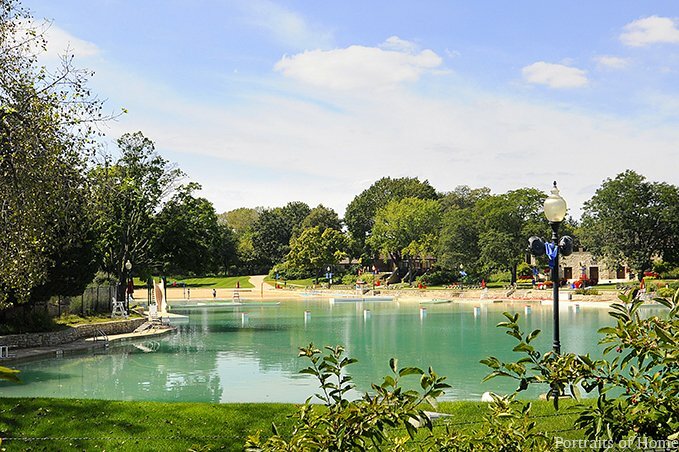 There’s so much to see, do, shop, dine, and experience while in Naperville. There’s over 100 shops and stores - everything from one-of-a kind to national stores. Dining options are sure to please every palate and food cravings with a wide variety of more than 40 places to eat and dine in the downtown area alone. 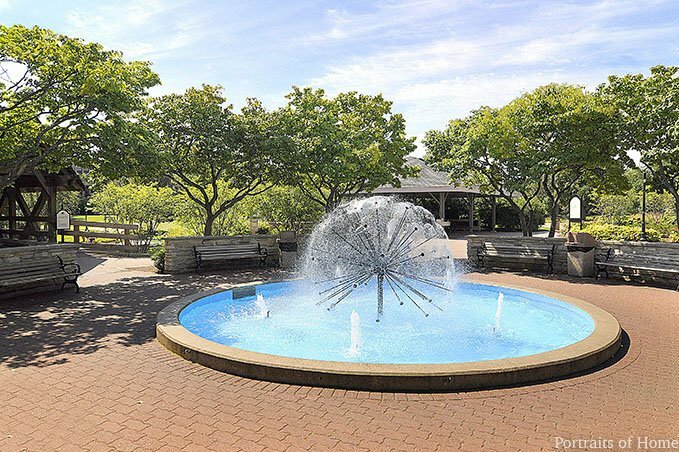 There are 2 downtown Naperville museums - Naper Settlement & DuPage Children’s Museum. Both museum’s are only 5 blocks from the Harrison House Bed & Breakfast! Naper Settlement is an outdoor history museum for all ages. Over 120,000 visitors a year are immersed in history as they learn about the past and how it relates to the present, from pioneer times to today, on over 12 acres. A must see on the grounds of the Naper Settlement is the Victorian Martin Mitchell Mansion. When it was originally built for the Mitchell's in 1883/1884, it was called “Pinecraig” by the Mitchell family. From 2000 to 2003, it was restored to its original splendor and glory. There are special events, programs and activities also held year-round. Speaking of history and learning about the past and how it relates to the present, downtown Naperville has a great 1 hour historic tour of Naperville with Naperville Trolley & Tours Ltd. The Naperville Historic Trolley Tour is every Friday at 11A during the summer months and offered monthly (around the 2nd Friday) during the winter months. There are also special season Trolley Tours such as the Halloween Lights Tour in the latter part of October and Holiday Lights Tour nightly during the first week of December. 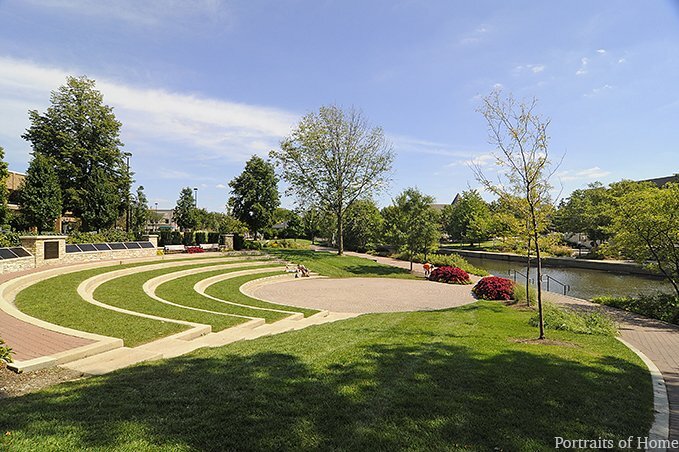 Walk, jog, or run for miles of gorgeous scenery on Naperville’s downtown Riverwalk. It’s only 4 blocks from the B&B! 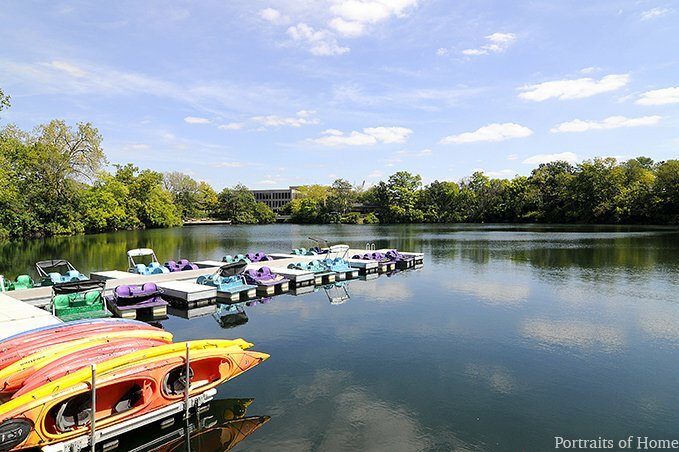 The Naperville Park District offers paddleboat and kayak rentals at the Paddleboat Quarry. The Paddleboat Quarry is located along the Riverwalk, on Eagle Street. Another free outdoor concert venue, only 5 blocks from the B&B, is at the Naperville Community Concert Center. 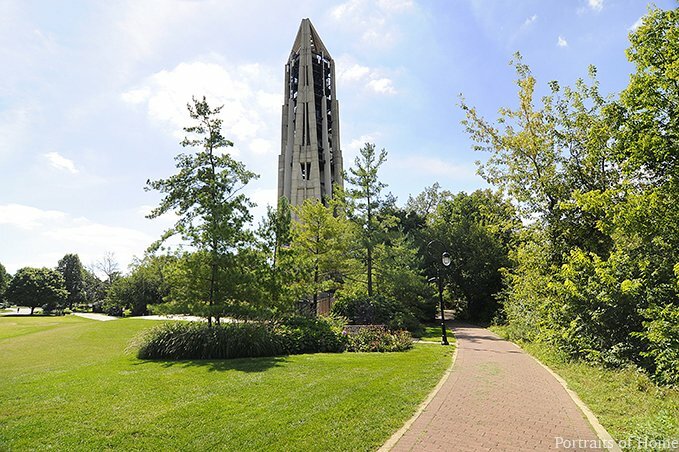 At the base of Naperville’s Riverwalk, on Rotary Hill, stands the majestic Millennium Carillon in Moser Tower (photo below). The Carillon is a unique, 16-story structure with a 72-bell musical instrument. Concerts run year-round each weekend, played by our talented local carilloneurs, with special Tuesday evening concerts during the summer. Centennial Beach: one of the largest chlorinated swimming pools with acres of sandy beach, a fun slide, high and low diving boards, and floating islands. Naperville boasts numerous bookstores. 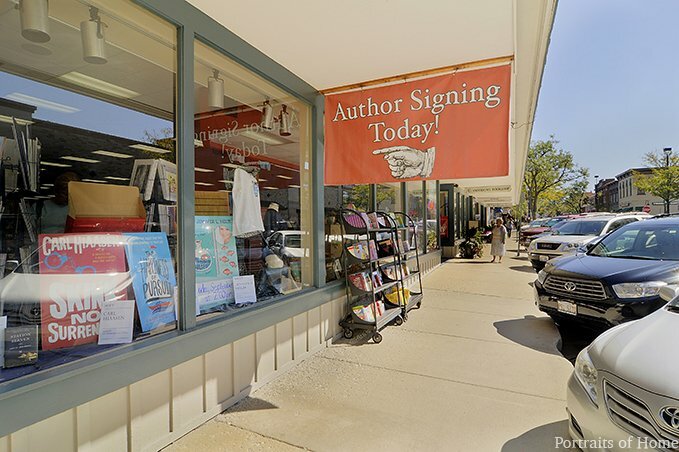 In the heart of downtown, 3 blocks from Harrison House B&B, is Anderson Bookstore who sponsors various authors’ visits and book signings all year long. It’s definitely the place to go to see & hear famous authors who’ll personally autograph their published books for you.